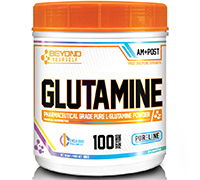 MUSCULAR RECOVERY AND BETTER PROTEIN SYNTHESIS, PURE EFFORT REQUIRES BEYOND YOURSELF GLUTAMINE! L-Glutamine is the most abundant amino acid found in muscle tissue. Over 61% of skeletal muscle is Glutamine. Consisting of 19% nitrogen, glutamine is the primary transporter of nitrogen into muscle cells. Research shows that Glutamine can help you raise growth hormone levels. According to one study, just two grams of L-Glutamine increased growth hormones by over 400%. Using BEYOND YOURSELF GLUTAMINE as part of your supplementation can help prevent muscle fatigue, aid with protein synthesis, accelerate recuperation, and boost your immune system taking you beyond yourself.